This incredible video shows the moment a model swam with crocodiles. 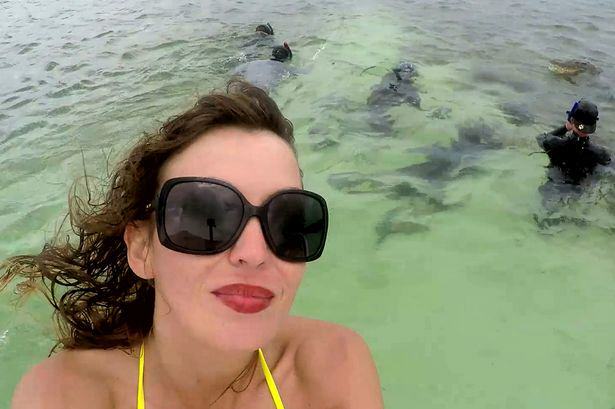 Daredevil Roberta Mancino spent 10 hours swimming with the deadly predators off the coast of Mexico. The crocodiles eventually became used to her presence, allowing her team to capture some stunning footage. I have a list of animals which I would love to swim with, so it was one of my dreams to swim with crocodiles. I have wanted to do this project for six years but I could never find someone to fund it because it is so dangerous. Obviously I don’t want everyone to start swimming with crocodiles but I wanted to show that they are not bad animals. I had to stay in the water for a long time to get an understanding of the animals – that is why you see me at first going down with a mask. Nobody really knew what would happen as no one has really done this before – spending that long, that close, next to a crocodile without a mask.